Dentures or Dental Implants in East Islip? Living with one or more teeth that are compromised or missing can be challenging. Eating when you can’t chew your food properly is difficult and worrying about the appearance of your smile takes a toll on your confidence. You’ve heard that dentures and dental implants in East Islip are both great solutions for replacing teeth, but which one is right for your needs? Here’s what you should know. Dentures are a removable oral appliance designed to replace an entire arch of missing teeth using a snug fit and suction to stay in place. 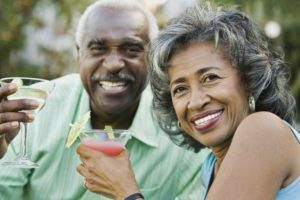 You may be thinking of the dentures your parents or grandparents wore; however, today’s dentures in East Islip are designed with your facial structure and skin tone in mind, which gives them an improved fit over dentures that were made in the past. They also provide a more appealing and natural look than the dentures your grandma wore. Dental implants are an ideal solution for replacing one or multiple missing teeth. For single tooth replacements, a dental implant is placed into your jawbone during a simple surgical procedure. Because it’s made of titanium, which is biocompatible, the implant will naturally fuse and integrate with your bone over time. Integration with your bone provides a solid foundation for your new tooth, which is a customized porcelain crown. Because a dental implant acts as both your new root and tooth, it provides durability and longevity that other tooth replacement options can’t deliver. Dental implants can also be used to support prosthetics such as a bridge or denture. With a dental bridge, implants can act as an anchor on each side to support one or multiple prosthetic teeth in the middle. For a denture, a few dental implants are placed strategically into the jawbone, and the denture is designed to snap into those implants, which provides a more secure and stable fit. Determining the best way to restore your smile is a big decision, and you might be surprised to find that you have choices! Your dentist in East Islip can discuss your options with you during a consultation after taking x-rays and providing a thorough examination. Together, you and your dentist can craft a treatment plan that will fit your lifestyle, budget, and goals for your teeth so you can smile and eat with confidence again. Contact your dentist today to schedule your consultation. Dr. Gary Rosenfeld has been serving the community of East Islip, NY for over 30 years. During that time he has hand-selected a team of dentists who share his goal and vision of providing comprehensive dental care for his patients. This means that we can provide the treatment you need from start to finish at our East Islip dental office whether you choose dental implants or dentures, or both to restore your smile. If you would like to learn more about the services we offer, contact East Islip Dental Care at 631-581-8600 or reach us online. Comments Off on Dentures or Dental Implants in East Islip?